You may have read about a Harvard University study that was published a year or so ago, which stated that sarcasm can increase your creativity. As references to this article continue to be passed around by bloggers and others, people are often forgetting to include the caveats about trust in the relationship and understanding when sarcasm is appropriate (i.e., sarcasm is not always great at work), which were included in Harvard’s article on the study. Like most forms of humor, sarcasm is better received when you’re not insulting individuals, but rather making fun of circumstances or human nature. This is true in one-on-one conversations as well as in speeches and media interviews. It’s better to save sarcasm for the people in your life who know you best and will know when you are joking. This post was written by Lisa Elia, a Los Angeles-based media trainer, presentation trainer, pitch coach, communication expert and speaker. She trains clients for media interviews, speeches, internal and external presentations, investor presentations and promotional videos. With more than 20 years of experience, Lisa has prepared clients for interviews with TODAY, GMA, The Wall Street Journal, CNN, ESPN, and hundreds of other outlets. Lisa has shared her expertise with national media outlets that include Inc., Entertainment Tonight, E! and many others. To discuss your training needs, contact the Expert Media Training office at 310-479-0217. The following crisis communication tips are meant to provide you with your initial steps. If you need help managing a crisis, call us at 310-479-0217. Or, email us at team@expertmediatraining.com. Crisis communication tip #1: Don’t hide. Do not answer questions from the media on the spot, but do take their calls and tell them you will get back to them within a certain timeframe, whether it’s minutes or hours, but try to do it quickly enough for them to meet their respective story deadlines. Stall tactics rarely work. If the media print or broadcast that you did not respond to their requests for information, the public may assume you’re guilty or that you have something to hide, which is not what you want. Create a statement and responses to the questions you may be asked by the press. In the heat of the moment, you may not think as clearly as usual. Enlisting the aid of experts who are objective and forward-thinking can help you to contain and manage the situation most effectively. Crisis communication tip #2: Control contact with media and the public. Don’t allow your staff members or team members to speak with the press about the situation. Ask that your family members and friends do not do so either. Only your designated media spokeperson(s) should address the media. Ideally, employees, vendors and others should have been advised not to speak to the media on your behalf. Perhaps they have even signed confidentiality agreements, as does everyone who works in our firm. However, it’s good to remind them of your policies during times of crisis. Crisis communication tip #3: Take responsibility when appropriate. There are times when it’s best to assume responsibility and quickly address what you are doing to rectify a situation. For example, if you sold a product that turns out to be faulty, consult a lawyer about what you should and should not say about it, but do address it. You can recall the product through news alerts that you send to the media and distribute it through social media, if many have been sold. If only a few products have been sold, you can contact the customers directly and offer them a refund or a replacement of the product. The worst thing you can do is ignore the situation, which can lead people to hire lawyers, investigate further and generally make a bigger deal of something that could have been kept in check with some simple communication. Crisis communication tip #4: Listen. Sometimes the best way to prevent a situation from becoming a crisis is to listen. Listen to people’s complaints and comments, even if there is nothing that can be done about them. For example, if you have said something regrettable to someone who is now making a public issue of it, apologize to the person directly, which may make the situation go away: sometimes people just need to be heard. If the issue continues to become more public, seek professional help to address the situation. This is not a time to wing it, and professionals can help you create a clear message and make a plan for damage control and containment. Crisis communication tip #5: Take action. Explain how you are taking action to address the situation. For example, if one of your staff members has said something inappropriate to someone, craft a specific response that explains why this is not in accordance with your company policy and how the employee is being reprimanded (or dismissed, in some cases). If you have implemented new policies due to this situation, explain what they are. When crises arise, the most important thing to do is to not panic. Then, get the help you need to create a swift and thorough crisis communication plan. To arrange a complimentary consultation to discuss your crisis communication needs, call us at 310-479-0217. The best time to work on your crisis communication plan is before a crisis arises. You will have greater clarity of mind without the pressure of a crisis, so you can effectively strategize on how you will address each audience, from employees to customers, to investors or other stakeholders. If you’re a service provider, crises can arise from several situations, including being discredited publicly, a verbal misunderstanding, or the use of a poor choice of words. If you produce a product, crises can arise from a fault in your product, problems with distribution, or questionable manufacturing procedures, among other things. These things can happen to individuals or companies of any size, from one-person shops to the largest corporations in the world. For celebrities, athletes and other public figures, how a crisis is managed can make the difference between preserving or losing lucrative endorsement deals and prospects. Planning ahead will help you to feel more in control and prepared for just about anything. To arrange a complimentary consultation with Lisa Elia, the author of this article and the founder of Expert Media Training, call us at 310-479-0217. This article was written by Lisa Elia, a Los Angeles-based media trainer, presentation trainer, communication expert and speaker. In addition to helping clients with crisis communication management and planning, she trains clients for media interviews, speeches, investor presentations and promotional videos. With more than 20 years of experience, Lisa has prepared clients for interviews with Today, Good Morning America, The Wall Street Journal, CNN, ESPN, and hundreds of other outlets. Lisa has been interviewed and shared her expertise with national media outlets that include Inc., Fox News, Entertainment Tonight, E! Entertainment and many others. To arrange a complimentary consultation, call us at 310-479-0217. Sometimes a TV producer or editor from a media outlet contact experts in the hopes that the experts will share exactly the opinion they want in order to shape their story. If you’re an expert, it’s important that you maintain your integrity and only say what you truly believe. Otherwise, you simply become a mouthpiece for others, and a few minutes on TV isn’t worth compromising your integrity. Know your boundaries and maintain them. There is so much that can be said about improving one’s communication skills that we could be reading (or writing) forever. Sometimes you simply want a list of reminders. This is such a list. It’s taken from my Confident and Clear Communication program, which goes into greater depth on each topic with exercises and questions to help you explore your unique communication patterns and tips to improve upon the aspects of your communication you wish to elevate. Negative self-talk comes in many forms, including putting yourself down, diminishing your accomplishments, not accepting compliments, or beginning sentences with, “I’m just a…”. It is not productive, it is disempowering, and it reinforces beliefs you don’t want to hold about yourself. 2. Pay attention to your posture. Changing your posture can instantly change how you feel and how you are perceived by others. 3. Replace criticism with compassion. Criticism of others begins with a negative judgment you are making about them. Love and judgement can’t exist in the same moment. If you want loving relationships in your life, whether at home or work, transform critical comments into more productive communication. 4. Be assertive, not aggressive or passive: identify the differences. Assertive communication is respectful, diplomatic, empowered and effective. 5. Read body language more closely. Pay close attention to your body language and that of others, to achieve the most effective communication. Our true feelings and thoughts are conveyed through eye contact, the placement and movement of the feet, hands, hips, legs, and more. 6. Polish your writing skills. Sometimes your written words create the first impression someone will have of you, and they could open doors for you, or close them forever. Make the choice to speak with power and confidence, paying attention to your vocal tone, fluidity and energy level. 8. Replace lazy listening with committing to the moment. Becoming a great listener will improve relationships and can lead you to great success. 9. Transform arguments and address delicate topics sensitively. Discover what’s beneath the argument so you can transform it into a productive conversation, and broach delicate situations with forethought and sensitivity. 10. Communicate to inspire, empower and motivate people. Approach interactions thinking about what you can leave people with and how you can inspire, empower and motivate them. If you would like to improve your communication skills or those of your team or clients, arrange a complimentary consultation with Lisa Elia. When delivering a speech, presentation or media interview, speaking from the heart is important, but your message must also make sense logically. There are times when a very passionate speaker can draw people in by affecting the audience emotionally, but if upon further reflection the argument or position presented by the speaker doesn’t hold up intellectually, the message loses its potency and the credibility of the speaker is called into question. The best messages resonate with the heart and the head. Preparing yourself or your team for media interviews includes understanding how to create and maintain good relationships with members of the media. Over the years, I’ve interviewed members of the media from outlets that include The Associated Press, Los Angeles Times, Clear Channel Radio and many others. Here are some tips based on what they shared. Let relationships develop over time. Like friendships, some of your media relationships will be closer than others, and they develop over time. In their excitement over getting a live editor or producer on the phone or meeting one in person, some people will overestimate the relationship and assume that now they’re friends, buddies…amigos. If this sound like you, take a step back. Think of one of your close friends. When you met this person, did you glom onto him or her the first time you spoke or did you chat for a bit, establish common ground and let the relationship grow from there? Allow members of the media to get accustomed to you and to want to hear from you. Don’t be intimidated, but know who owns the ball. It’s easy to feel intimidated by someone who writes for the Wall Street Journal or who is responsible for booking interviews for Bloomberg Businessweek or Good Morning America, if you’re not used to speaking with people in these types of jobs. It’s important to remember reporters and TV and radio bookers need experts and people to interview you as much as you need them to share your message. However, keep in mind that if you were children playing in a schoolyard, you are playing with their ball: they make the rules. You can choose to follow the rules, or negotiate to alter them, or walk away. Return calls from the media promptly and provide information they have requested quickly. Many people miss fantastic opportunities for top-level TV, radio and print interviews because they don’t respond quickly enough. Even if you don’t feel ready for an interview when a media opportunity arises, return the call and either negotiate a different time to do it or politely and graciously decline. Be easy to work with. Be kind, respect their time, never be pushy, and appreciate that they have opinions and may or may not like what you have to offer. Help members of the media when you can with additional information or resources and be a pleasure to work with. Sounds like life, doesn’t it? 6 Tips for More Effective Presentations Video Tips - a page full of videos with tips to improve communication, presentations, speeches and media interviews. Contact us to arrange a consultation with about your media training or presentation training needs by clicking here. Or, call us at 310-479-0217. Giving back to the community in various ways has always been important to me, especially when it comes to education. Last Thursday I visited Ánimo Leadership Charter High School, where I made a presentation about my work and career path to become a media trainer and presentation trainer. This was all done through Youth Business Alliance, an organization that connects people in the business world with local schools to expose students to a variety of careers and advice they might not have access to otherwise. I was impressed with the depth of the students’ questions and their willingness to participate in the practice college interviews I conducted to give them a feel for the work I do as a trainer. Of the two students who volunteered for the practice interviews, one wants to study aeronautical engineering and the other wants to pursue criminal justice because she’s passionate about protecting individuals’ rights when dealing with the judicial system. Encouraging and guiding students like this was a true pleasure. Several months ago, I was hired to provide media training for the family of the Bella Twins, stars of the E! Entertainment TV show, “Total Divas”. While the twins, Brie and Nikki, are accustomed to being in the spotlight, their mother Kathy and brother JJ were less so. As I prepared them for their inaugural trip down a red carpet, which was to be at the ESPY Awards, I made sure to ask them the many prying questions that members of the media might ask about the Brie and Nikki, among other things. Part of our training session was included in last night’s episode of Total Divas. As with most TV interviews, you have no control over what finally airs. The link below is to a very small portion of the training session. As you can see, JJ’s responses to my questions were entertaining, but if he used them in an actual media interview, he could have led the conversation down an unintended path. Fortunately, he listened and made adjustments, as the best clients do. One of the things I love about my work is the diversity of clients I get to work with; corporate clients one day, and athletes and their family the next. 1. Know what drives your audience at any given time; pain avoidance or aspiration. Some people are more motivated to avoid pain, thus the “speak to their pain points” advice that has proliferated on the Internet for the past decade. Others are more motivated by their aspirations or ideals. Most people’s motivations can vacillate between pain avoidance and aspiration, depending on the matter at hand. When preparing for media interviews, presentations and panel discussions, consider which form of motivation is strongest for your audience in relation to the topic you are discussing and shape your messages accordingly. 2. Pay attention to the fringes. Many people focus only on their primary target market and they often ignore or overlook smaller market segments and key influencers. (Key influencers are the people who influence your target audience’s decision-making process and can include business advisors in other fields, managers, agents, assistants and spouses, among others.) Maintain visibility, or relationships, with ALL of your publics; your target market as well as opinion leaders, key influencers and secondary and tertiary markets. Tides change in the world and in business, and there may be a time when your secondary and tertiary markets become important to your bottom line or your position in your industry. As you prepare for media interviews, presentations and panels, identify logical places where it makes sense to address the needs of your secondary and tertiary markets and key influencers. 3. Draw out silent members of your audience. There will be times when a segment of your target audience or certain stakeholders do not speak out. Instead of assuming they will not do so at some point or that the silent members of your group or audience support you, take steps to find out what they truly believe and want. During media interviews and presentations, make reference to the ways people can provide feedback and make their voices heard, such as a text line/hotline, online form or other forum you have created to gather feedback and ideas. Just because someone has been supportive of you in the past, doesn’t mean the relationship will be fine in set-it-and-forget-it mode. It’s easier to maintain a relationship than to rebuild it. Take advantage of opportunities during media interviews, presentations and panel discussions to acknowledge the people or organizations that have been your long-time supporters. If you can address how you serve their needs, your moments in the public eye can help to maintain your relationships. 5. Identify and fill the gaps of dissatisfaction. Consider how you can discover and address unmet needs and dissatisfied people. Most successful companies and products were inspired by one individual’s desire for, or identification of, something that was lacking in the marketplace. When preparing for media interviews, presentations and panel discussions, create messaging regarding what you and/or your organization have done to discover and fill the unmet needs of your supporters and those who are dissatisfied with the status quo. Show them how you provide the solutions they are seeking. “I don’t trust you. I don’t know why, there’s just something about you.” – These are words some entrepreneurs have heard spoken on “Shark Tank” and they’re words that no one wants to hear after a media interview, presentation or pitch. What leads to a lack of trust? Quite often it’s body language. 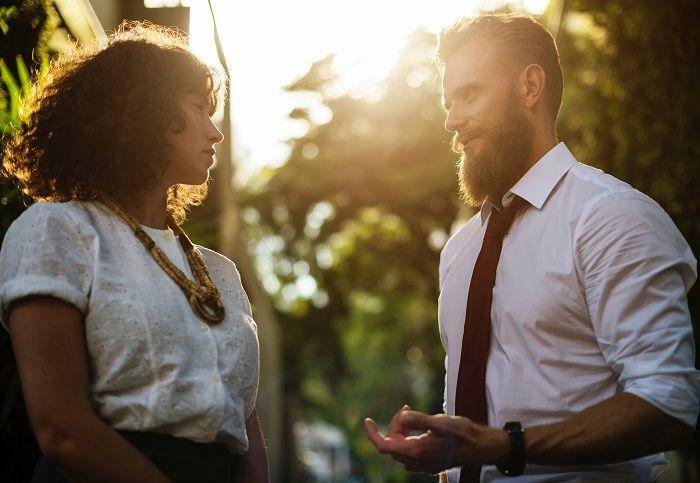 In conversations or when watching you in media interviews or presentations, people generally pay more attention to body language than they are consciously aware of doing. Most people process language and speech in the left hemisphere, and nonverbal or spatial skills in the right hemisphere. While your audience or viewers may hear every word you say, part of their brain is assessing your body language, noticing any disparities between your words and your movements or other “tells” that may indicate the lack of truthfulness, confidence or commitment to your words. The more you know your material well, are committed to your ideas and gain the confidence that comes from mastering your content, the more your body language and movements will be authentic and synchronized with your words. This will help you to establish trust with your audience. Read a more in-depth post about body language. Let us know if you have questions about our process or services.